We can, of course, total the columns. We can even use functions like SUMIF and COUNTIF to add up the data based on conditions, like the number of occasions four or more units were sold, or the total income on or after a particular date. But as soon as we want to combine 2 or more conditions, these basic functions let us down, since they are limited to only a single condition. Add up where it says 'South' in column B and where the date in column E is 02/08/03 whatever is in the corresponding row of column C.
Note the interesting framing of this function by the curly brackets. This is required of every array formula, but you can't just type them. After typing in the rest of the formula, you simply type [Ctrl]+[Shift]+Enter, rather than just Enter, as you usually would. Excel will add the curly brackets automatically. Also remember that whenever you edit the cell with an array formula in it, you should exit with the same 3-key combination. The power of the array formula soon becomes apparent once you start playing with more fields and bigger, more complex lists. Some time ago, infatuated with arrays, I built a large spreadsheet to track results of 3,000 salespeople going through a number of assessments. I had array formulae to show how many people had passed how many assessments mapped against dates, assessment centres and case studies. In all, there were several hundred array formulae across a few worksheets in the one file. I was delighted with my achievement, and installed the file on the client's network. As more and more data came in, though, it started taking longer and longer for the file to open, close or save. Before long, users were having to wait 4 minutes or more to get their statistics, and another 4 to close the file again. Clearly, this wasn't acceptable and I determined to find out what was happening and what I had done wrong. The answer turned out to be nothing; I hadn't made any mistakes, and the sheet was working exactly as I'd designed it to. But I'd had my first taste of "array crawl". It seems that array formulae are highly volatile. In Excel terms this means that they will be forced to recalculate at the drop of a hat. Virtually anything you do in Excel will cause a chain reaction forcing all your arrays to recalculate, whether or not whatever you've done has any impact on them – and remember that each individual array formula could represent thousands of calculations. I was using far too many of them and they had to go. But my sheet depended on them utterly. How could I do without them? The answer actually turned out to be quite easy. I knew about the Database functions – DSUM , DCOUNT and the like – but they'd never seemed terribly useful to me. I was about to be enlightened in a big way.
' Database ' is the range of cells which contains the data you want to query. It should contain a title row and look pretty much like the example we're using, although it can be any number of columns wide, and any number of rows long. Often, you will want to define a dynamic range name for it.
' Field ' indicates which column is used in the function. For example, are you totalling units sold, or the unit price?
' Criteria ' sets out the conditions you want to match, and here a little knowledge of advanced filters will pay dividends, because this works in exactly the same way. In order to prepare for the D formula to work, you effectively set up as you would for an advanced filter. So let's set up the filter. Look at the range in G6:K7 below. I started by copying and pasting the entire title row. This is a good idea, because any misspellings at all will make the D-functions fail. Then we can type under the headings any criteria we want for each field. 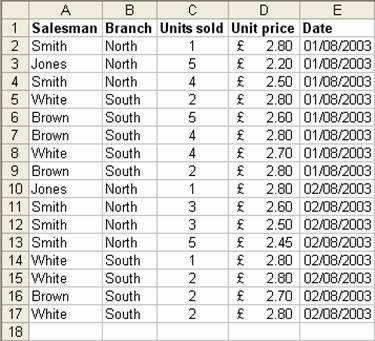 In our example, we just want to identify those sold by South on 02/08/03, so I've entered those details in the appropriate columns. This would do the trick quite nicely, but if you're only using criteria in those two columns, you could simplify as in the range G10:H11. Look at the three arguments in detail. The 'database' is A1:E17, which is the table containing all the data to query, including the column titles. At the end, the 'criteria' refers to G6:K7, where I've set up the advanced filter. Note that I could have shown G10:H11 using the simplified table for the same effect here. So I recoded my 4 minute sheet using D-functions. The sheet now has even more data than before and is open and usable within 5 seconds. In all respects it is just as good as the old one, but is now an entirely array-formula-free zone. I have a personal rule these days; if I ever find myself going beyond 10 array formulae in a spreadsheet workbook, I convert to D-functions before moving on. This has been an introduction only to the D-functions, and how they can replace array formulae in your spreadsheets. I hope it will be enough to send you off to the Excel help file to check out the other D-functions. I am sure you will find as I did that these tools can exceed array formulae in terms of power and speed and that, like me, you won't look back. 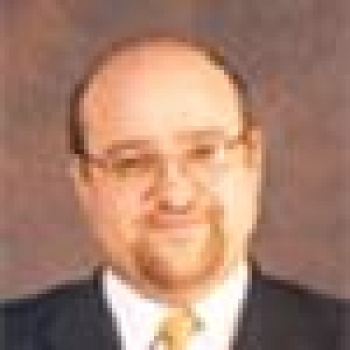 Ray Blake is Head of Software Design for GR Business Process Solutions, a UK based consultancy. He creates a range of IT solutions, primarily using Excel, Access and VBA.